Doors and frames are formed from bullet resisting steels, suitably reinforced as required to meet UL test criteria. Frame corners are mitered and welded. Both doors and frames are supplied with all necessary internal hardware reinforcements. Double rabbeted clamp-on frames are telescopic which adjust to variations in wall thicknesses by clamping the wall opening. Finished wall thickness must be specified at time of order. Assemblies are supplied with UL-Listed Bullet-Resisting glass, non-tinted, of appropriate thickness and type to achieve the UL listing specified. Custom sized vision opening are available upon request. Window size must be specified at time of order. Desired threat level must be specified at time of placement of order. Both door and frame are supplied with prime painted finish. 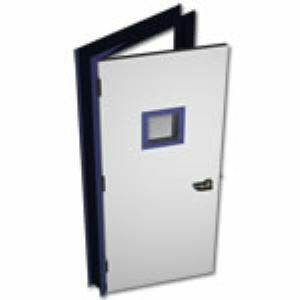 All bullet resistant rated doors and frames may also be UL fire-rated for up to three hours under UL standard 10B fire tests of door assemblies. Desired fire rating must be specified at time of order. Door and frame are reinforced, mortised and appropriately drilled and tapped for installation of hardware, If hardware is included, it is supplied in a separate shipping carton, normally individually for each opening. 1½ pair Hager hinges, Model BB1168; 5" x 4½" NRP (non-removable pin), with US26D (dull chrome) finish. One Corbin Russwin Mortise Lockset Model ML 2057 with US26D (dull chrome) finish. One Norton 1604H x Al surface closer. 1½ pair Hager hinges, Model BB1199; 5" x 4½" NRP (non-removable pin), with US26D (dull chrome) finish. 1½ pair factory customized Hager hinges, Model BB1199; 6" x 5" NRP (non-removable pin), with US26D (dull chrome) finish. Electric strikes, position indicators and hinge sensors are available and may also be prepped for.